Thank goodness the weekend is almost here because it's going to be a good one. I'll be at the OysterFest Saturday and looks like I'll be heading to the Head of the Charles Regatta on Sunday. This weekend marks the 44th Head of the Charles Regatta. 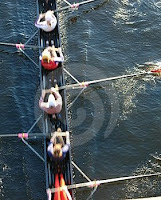 Head Of The Charles Regatta®, the world's largest two-day rowing event, was first held on October 16, 1965. The race was established by the Cambridge Boat Club members D'Arcy MacMahon, Howard McIntyre, and Jack Vincent, with the advice of Harvard University sculling instructor Ernest Arlett. Arlett proposed that a "head of the river" race similar in tradition to races held in his native England, be held on the Charles River. Over the past 45 years, the Head Of The Charles regatta has grown tremendously. Today, more than 7,500 athletes from around the world compete in 55 different race events. The Regatta grew to a two-day event in 1997 and now attracts up to 300,000 spectators during the October weekend. [He'll] be racing in the Men's Lightweight 8 for Riverside Boat Club (blue and white vertical stripe oars, blue and white stripe uni). The race is staggered at the start and bow #1 goes through the start line at BU at 2:42 PM. We have bow #5. I think a good place to watch would be the Weeks footbridge at Harvard (~5 min. walk to the river from Harvard T). Should be a great time, I'll see you guys there. Click (here) to go to the event site. 0 Response to "Head of the Charles Regatta This Weekend"